Despite cruddy weather, about 50 anglers showed up Saturday for the Chisago Lakes Lions Carp Contest — and they found plenty of carp. 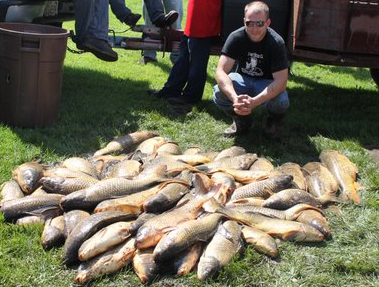 Organizer Steve Levey said they hauled more than 300 carp totaling more than a ton from North Center and South Center lakes. “The largest was a 19-pound, 10-ouncer,’’ he said. Most of the carp were taken with bow and arrow, but some legally used dip nets to remove them from the lakes. Jesse Mishler of Stacy (seen in photo above) hauled in 68 carp himself -- the most from one contestant. He shot some with a bow and arrow, and dip-netted others. It was the second year of the contest, part of a larger carp festival, the brainchild of Levey. “If we had better weather, we would have had another 40 or 50 people show up,’’ he said. He wants to remove as many bottom feeders from the lakes as possible, and figured the contest was a good way to start. Carp destroy habitat and harm water quality. Mature females can produce up to 1 million eggs, and Levey said perhaps 150 of the fish caught were females meaning 150 million eggs didn’t end up in the lakes. “Half the carp were 12 to 13 pounds,’’ he said. “I think it was an eye-opening experience for those who came to see the fish.’’ He said the Lions plan to try the event again next year. “I think it will grow into something pretty good,’’ he said. The carp caught Saturday ended up as fertilizer at a Wisconsin farm.